Silver Spring, Maryland–(ENEWSPF)–March 23, 2017. 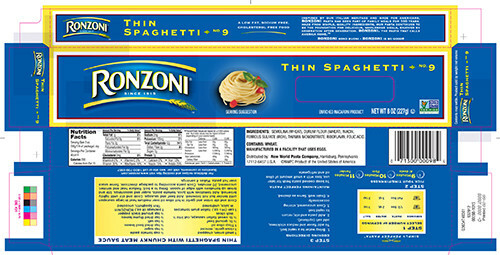 Riviana Foods Inc. is voluntarily recalling 610 cases of certain coded Ronzoni® Thin Spaghetti cartons that may contain an egg fettuccine product. The affected Ronzoni Thin Spaghetti cartons do not declare the allergen “egg”, which is an ingredient in the egg fettuccine product. People who have an allergy or severe sensitivity to egg run the risk of serious or life-threatening allergic reaction if they consume these products. The affected product was processed at a Riviana co-manufacturer’s facility on January 20, 2017. The only product at issue can be identified by the manufacturing code and UPC number listed on the left end of the package as listed in the chart below. No other varieties and no other manufacturing codes are included in this recall. At this time, Riviana has received no consumer communications about the affected product with this code date and no reports of illness or injury associated with this product. Riviana has instructed distributors and retailers who purchased affected product from Riviana to segregate the recalled products from their inventories so that a Riviana sales representative may assist retailers in the disposition of the product. Consumers should return the affected product to the store where they purchased it for a full refund. Consumers who may have questions or concerns should call Riviana’s toll free Consumer Relations number at 1-800-730-5957 between 9 am and 5 pm (Eastern).